Four decks will take the field at the start of today’s column. At the end, only one shall remain, having risen above them all to become the winner of the Turian Division, and primed for battle to claim the honour of representing the Forsythe Conference in the finals. Flyover tragically mulliganed itself out of contention. Unstable Terrain couldn’t withstand the Phyrexian menace. Garruk’s Deck fell to another surprising upset, leading some to wonder if the Duel Decks haven’t fallen under some sort of playoff curse considering their other showings. Finally, the Slivers were bombed out by a very engaged Metallic Dreams. And now, let’s get down to business! An early race sees Presence populating the skies, with a turn 2 Sage Owl, turn 4 Snapping Drake, turn 5 Djinn of Wishes, and turn 6 Air Elemental. 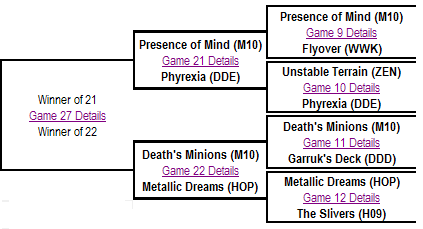 It looks to be a fast win against the Phyrexians, whose best play has been a turn 3 Priest of Gix into a Phyrexian Arena. That is, until Living Death hits the table, sweeping the skies. However, with the Phyrexians at 4 life, all Presence needs to do is hold out for a few turns, and the Arena does their work for them. The unthinkable has happened- Phyrexia is out in a two-game sweep! The deck falls prey to its own scattered strategies, getting out Lightning Greaves, Hornet Cannon, Phyrexian Arena, and Puppet Strings, but few defenders or threats. 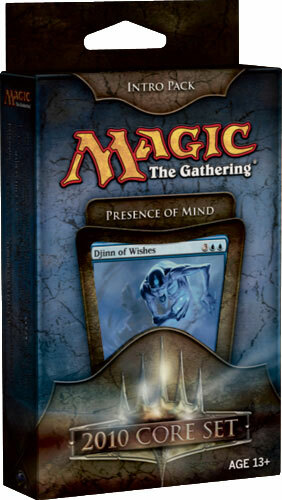 Presence Negates a Phyrexian Totem, and gets out a Coral Merfolk, Air Elemental, Zephyr Sprite, and a Phantom Warrior. Even death can’t stop the Warrior- after he meets a Hideous End, he Rises from the Grave to deliver the lethal blow while the Hornet Cannon can only hold the Elemental at bay. In the end, too many toys, not enough playmates. The Minions get out an early Wall of Bone but is not content to hide behind it, playing in subsequent turns a Howling Banshee, a Nightmare, and a Zombie Goliath. Alas for them, Dreams gets some early ramp and hits its land drops to get out a turn 6 Bosh, Iron Golem after early action with a Myr Enforcer and Loxodon Warhammer. Minions Diabolic Tutors up a Naturalize to deal with Bosh, but Bosh gets sacrificed to himself to blast the Nightmare. A Skeleton Shard promises many happy returns, while the Loxodon Warhammer on an Etched Oracle (after a Doom Blade silences the Enforcer) pounds away. Bosh the Sequel swings in for the final blow, fittingly enough. This game promises a repeat of the last in some ways. Again Minions produces an early Wall of Bone, along with the Zombie Goliath and Nightmare. A Looming Shade joins the fray, and the ton of Swamps behind it promise a beating. Dreams manages three mana Myrs, then Fabricates a Loxodon Warhammer for the Lodestone Myr. Massive blows are traded (Death’s Minions swings- and connects- for 21 damage at one point), but lifelink keeps Dreams in the hunt and they at last prevail after a Pentavus is deployed. A classic! The finals of the Turian Division, Metallic Dreams has been steamrolling its opposition. Can it last for one more match against the overperforming Presence of Mind? Mana, mana everywhere, nor any drop to drink! Dreams has a most enviable board position- land aplenty, a pair of Pentad Prisms, and two mana Myrs- but all it manages is a Nuisance Engine and a Wizard Replica. Presence takes to the skies with a pair of Snapping Drakes and a Sage Owl, with a Horned Turtle manning the fort. Turns out that’s all it needs- Dreams draws a Door to Nothingness (that it has the mana to trigger!) one turn too late to steal the game. Metallic Dreams doesn’t seem well-equipped to answer the aerial threat presented by Presence, and about all it can do is hope to put on enough pressure to keep them grounded. A Darksteel Forge and Cranial Plating certainly help, but Presence gets momentum in the air with an early Zephyr Sprite followed by a Snapping Drake and Air Elemental. Dreams catches Presence tapped out to drop Bosh, Iron Golem, but next turn Presence legend-rules him out with a clever Clone. Dreams still can’t resolve a decent and immediate threat (an Etched Oracle gets Essence Scattered), and eventually gets grown to dust in the skies. And that brings today’s installment to a close. Stay tuned next time when we bring you the opening round of the last division remaining in our march toward crowning a champion! Holy cow! This is really turning out to be a surprise tournament. Poor diluted Phyrexia lost. Dreams lost too. Just amazing. However, like my predecessor I take the opportunity of wishing all the readers a very merry Christmas!